Huck lives in a small town where everyone knows each other. He was raised in an orphanage and tries to do a good deed every day. Some people think Huck’s slow, but the truth is “he’s special.” And by special, I mean that he has superpowers. Everyone in town knows, but they keep his secret. The first issue follows him over a week of good deeds…but as he’s trying to figure out what to do on Friday, he hears about Bako Harim kidnapping school girls in Africa. He decides to go rescue them. After this, someone in town realizes they can make a lot of money by leaking this to the press. The issue ends with the press arriving en masse at Huck’s house. While it has been done to death, I still love when we can get a fresh new twist on the Superman mythos. Millar always has great ideas, but sometimes his work can be divisive. This time, the execution was right on point. The last few Millar series I’ve read (MPH, Starlight, and Chrononauts) have all been great, and Hack falls in the same territory. I really liked how much characterization we got here without Huck actually saying all that much. People reactions to him and talking about him created a great picture of Huck. By the end of the story, you knew this character really well. Millar basically just stepped back and let this story tell itself, and it worked perfectly. 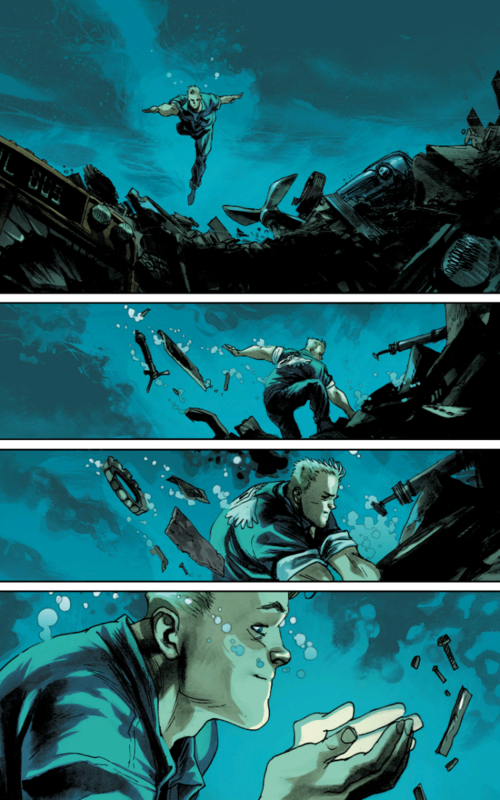 I also thought it was pretty cool that Huck didn't just use his powers to be a "hero." Sometimes his good deed is as simple as buy everyone behind him in a drive thru lunch. He's just a decent guy, even if he didn't have super powers. While the “superhero” market is ridiculously overcrowded, I appreciate that Image still manages to provide unique angles to superheroes. At the same time, Image is exploring a lot of genres. To me, that makes them one of the best comic companies out there. I was also real surprised to see Bako Harim touched on here. We don’t see a lot of real world issues dealt with in superhero comics. Typically these comics feature thinly veiled analogs, but this time Millar decided to take on Bako Harim directly. To me, that really helped set this book in the real world, which was a bold choice and pulled off really well. Rafael Albuqueque’s art was great here. He just fit the style of the book perfectly. For the most part, this book seemed real simple and straight forward. Millar and Albuqueque just made it seem so easy. 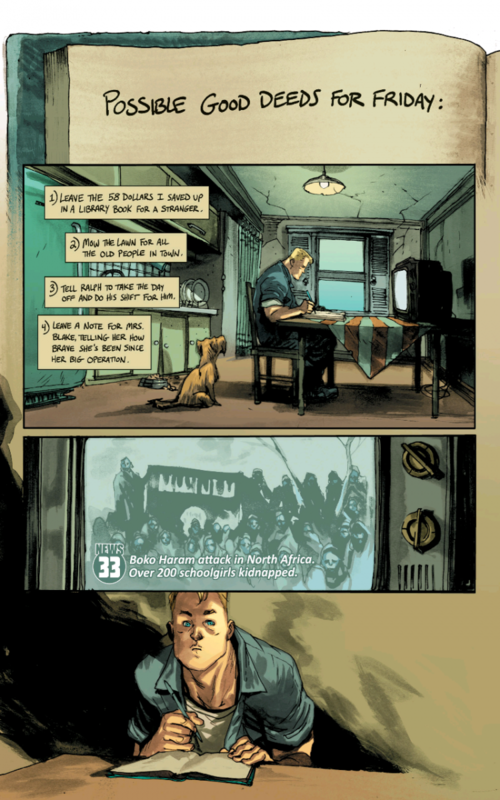 I can’t wait to see where this series goes now that Huck’s secret it out. I also loved that the cover price was only $3. Too many series launch at $4 or even $5 these days (thanks, Marvel, you chiselers). At $3, I am definitely more inclined to check out new books, especially by proven creative teams. By the way, if you enjoyed this review, I would also suggest you might want to check out Savior, by Todd McFarlane. Savior just finished it’s first arc, and is another “Superman” homage. Savior has a much darker tone than Huck, but both are terrific books. A real solid first issue. Premise is introduced real well, characters are clear and well laid out. Dealt with real world issues, not just "cute" analogs. Is it worth your $3.99? Yes! Mark Millar has been on a real roll lately. I've loved everything he's put out for Image over the last few years. Huck is off to a great start.